Many of us have spent the last few days restlessly checking news updates and keeping tabs on the spread of nearby destructive wildfires. The tragedy of our neighbors losing more than 100 homes, over 4000 acres and 35 horses is devastating for many local families. 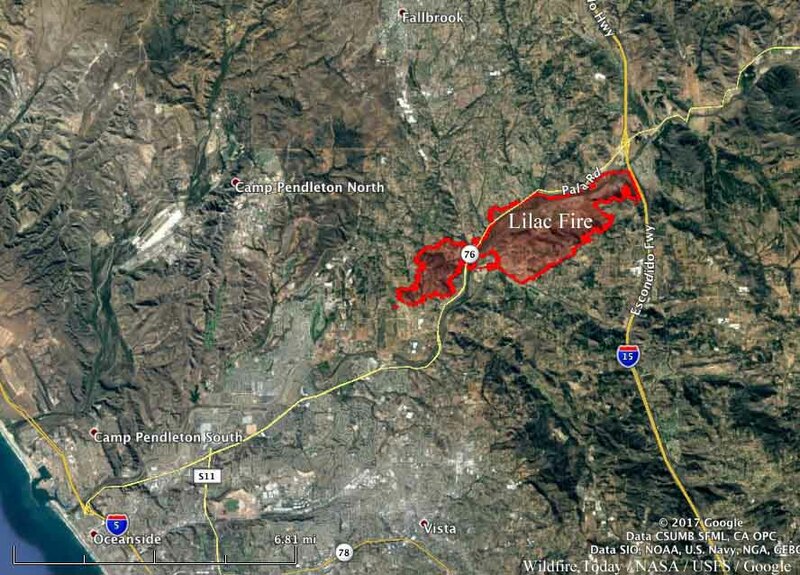 And statewide, wildfire damages are beyond heartbreaking. Rest assured that the City of Encinitas is vigilant and prepared. The Encinitas Fire Department and city staff have assembled an emergency operations team and we’re loaning our equipment and personnel to help fight the Lilac Fire in Oceanside and Bonsall. While we in Encinitas have not seen fires within our city limits so far, we have opened the emergency evacuation road alongside the Olivenhain community to help fire trucks and residents move more freely. Encinitas stands ready to help where needed, while doing everything possible to prevent catastrophe. Digging for beach sand in Washington, D.C.
Here’s our team, tasked with obtaining federal funds to preserve and replenish sand on our beaches. Without it, the coastline will erode at an accelerated pace, jeopardizing public safety, major infrastructure, utilities and commerce. 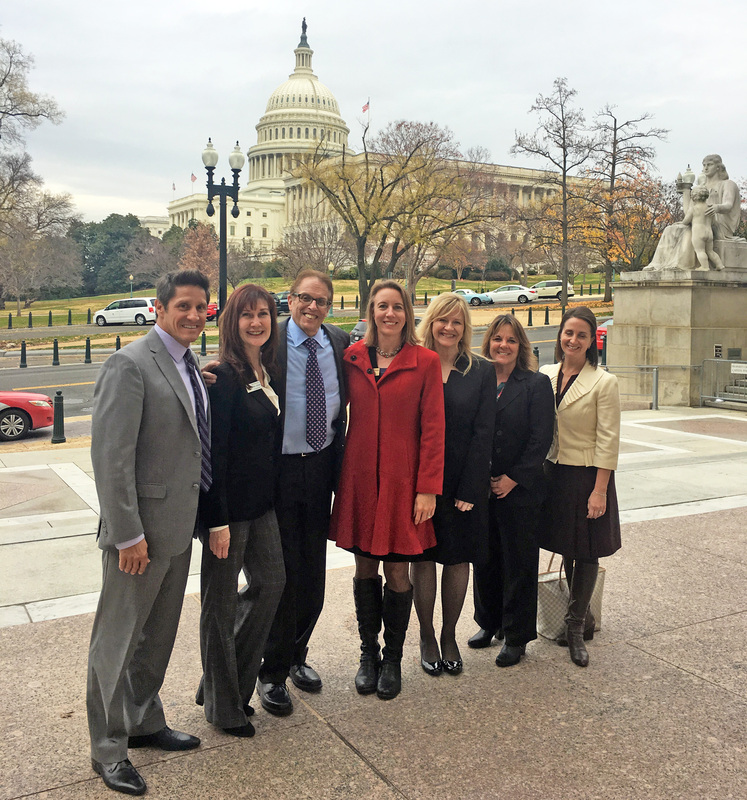 In front of our nation’s Capitol Building are (l. to r.) Solana Beach City Manager Greg Wade, Solana Beach City Councilmember Jewel Edson, Solana Beach lobbyist Howard Marlow, me, Encinitas City Manager Karen Brust, Encinitas project manager Kathy Weldon, and Carpi & Clay advocate Julie Minerva. I spent the beginning of last week in Washington, D.C. on an advocacy trip seeking funding for sand replenishment on our city’s beaches. If funded, the project would put sand on beaches in Encinitas and Solana Beach about every five or ten years for 50 years. Proposed as a federal project 14 years ago, it continues to make its way through the regulatory process. What was clear after seven meetings with elected officials and agency staff, including the Office of Management and Budget, the U.S. Army Corps of Engineers and all of our congressional delegation among others, is that this project is well-known and continues to be on track. One insight I had while there is that beaches in urban and suburban areas are human-made infrastructure, just like sidewalks and roads. Development along the Pacific coastline has choked off the beaches from their natural replenishments. These days, there isn’t much sand flowing from stream beds and eroding from bluffs. We expect to spend money maintaining sidewalks and roads, but it sometimes doesn’t seem as obvious that it also takes money to maintain beaches. There are clearly recreational benefits to sand – it’s much more pleasant to sunbathe with a beach towel on soft sand instead of cobblestones. But importantly, sand on the beach protects the bluffs from crumbling when hit by the waves, and insulates nearby roads from being overtopped during high tides. In low-lying areas, the ocean has overtopped Coast Highway 101 more than 40 times, causing major traffic delays, degradation of the road and damage to vehicles from projectile rocks. When we have sand on the beaches, the waves are absorbed by the sand instead of rushing over the road. Areas hit by 2012’s devastating Hurricane Sandy in the northeast U.S. fared much better where there had been sand nourishment projects. A new park is coming to Encinitas! The city doesn’t build many new parks, and we’re excited to be finalizing one that had been put off for many years. 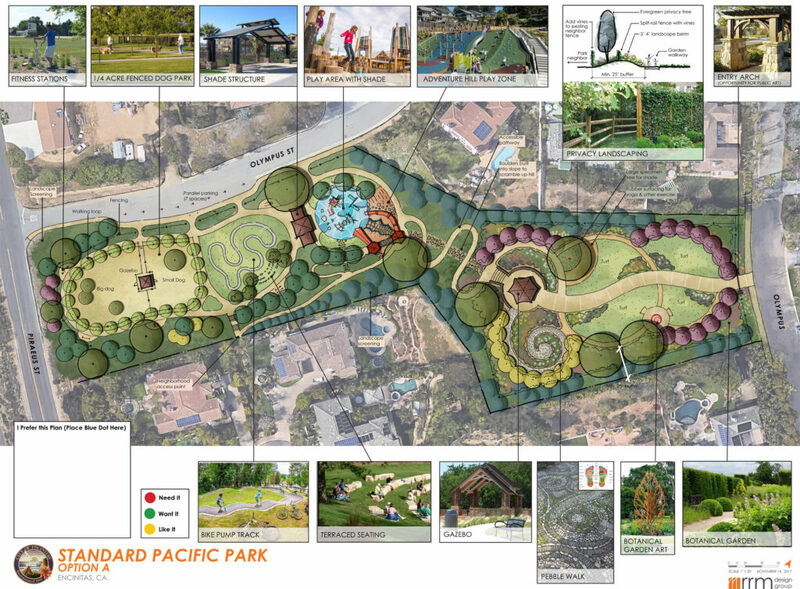 The design is still in process for the $2.7 million neighborhood park in Leucadia, east of I-5 on what’s called the Standard Pacific Park Site (this name will change). This 3.1 acres was set aside for a park by a development project more than a decade ago. A public workshop to review the current project design is scheduled for 6 p.m. December 12th at Capri Elementary School. 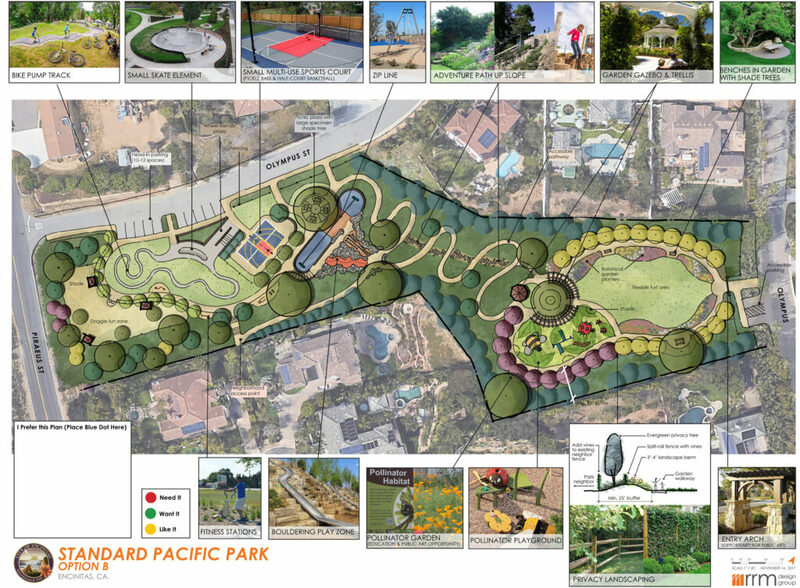 There are some great proposed amenities – a multi-use sports court with pickleball and basketball, a zip line, bouldering play area, bike pump track, dog park, adventure hill play zone, and pollinator garden. Above are two plans that will be discussed at the workshop; you can click on the plans to enlarge them. 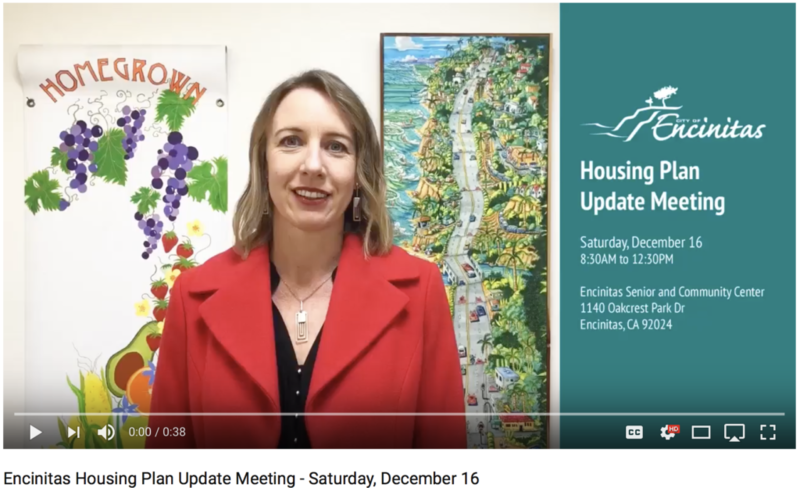 Click to see a short video about next Saturday’s housing meeting, which will be open to public comment. Next Saturday morning, December 16th, from 8:30 a.m. to 12:30 p.m. at the Encinitas Senior and Community Center, we’re having a public housing meeting instead of a City Council meeting to discuss and evaluate the sites for a housing plan that will be taken to the voters. Every city is required by law to provide the zoning for new housing. Tempting as it may be, we’re not allowed to “just say no” to more people in Encinitas. The required increase is a relatively modest amount – 1600 units of zoning for new housing in a city that has 25,000 housing units. The elected officials and our two advisory members will have four hours to go into detail on our housing situation and possible sites for new housing. Public comment will be taken at the beginning, so please come and participate! 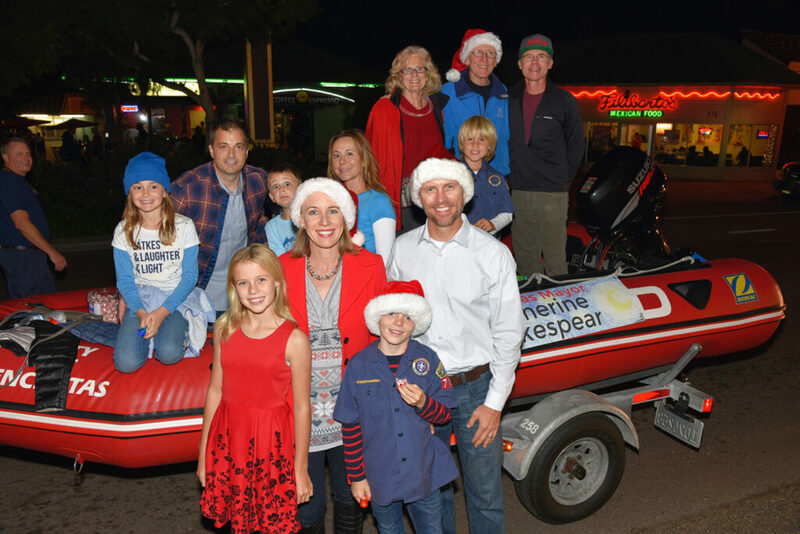 Another wonderful Encinitas Holiday Parade! Photo by Rob McKenzie.